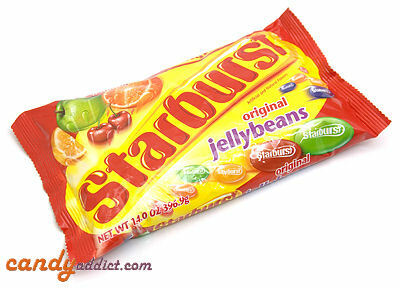 For our third entry in our Spring Jelly Bean Hunt, today we bring you original and sour flavor Starburst jelly beans! These jelly beans are a bit on the sweet side, but they’ve got enough flavor that you know what you’re eating. Both the original and sour flavors have a bit of a sugary shell – not as thick as the Necco Jelly Beans, but thicker than the Jolly Rancher Jelly Beans. Both have a good texture but be forewarned that for some reason they stick to your teeth a bit. Color: Purple, Flavor: Grape – Ok, I know these say “original” flavor, but I think they must mean original as opposed to sour, because there is no grape original-flavored Starburst. Regardless, I did enjoy this grape flavor, particularly the balance between sweet and tart. Color: Red, Flavor: Cherry – I know these are Starbursts, but this cherry flavor reminds me of wild cherry LifeSavers for some reason, particularly on the finish. And, like a cherry LifeSaver, the flavor really lingers after you eat the Starburst jelly bean. Color: Yellow, Flavor: Lemon – The lemon jelly beans have a really strong lemon flavor but I found it a little too artificial and too sweet for my tastes. Plus, it left a funky aftertaste. I liked the sour version of these way better (see below). Color: Pink, Flavor: Strawberry – I really love the strawberry Starburst chews. So I was really disappointed when this jelly bean totally failed to live up to its cousin. The jelly bean starts off with a light strawberry flavor then quickly loses it. By the end, all I could taste was a kind of bland sweet flavor. Bummer. Color: Green, Flavor: Apple – The apple flavor was my favorite in the bag. These jelly beans have a great, strong apple flavor. The flavor faded out a bit on the finish, but enough apple remained to make it tasty. These are on the sweet side, so if you like your apple flavor tart, check out the sour review below. I liked these best when I ate more than one at a time. Color: Orange, Flavor: Orange – Well, the orange flavor is really strong but it’s also tastes really fake. I found these off-putting because they left a really weird aftertaste that was really hard to get rid of. This was my least favorite original flavor. Overall, the original flavor jelly beans are pretty good as individual flavors. However, for me, I found that mixing the flavors vastly improved them and made them much more fun to eat. While I liked these jelly beans, I think calling them “sour” is a bit of an overstatement. “Tart” would be closer to the truth. Still, they are definitely more sour than the original flavor. Color: Blue, Flavor: Blue Raspberry – While these do have a typical blue raspberry flavor, it isn’t very strong. Plus, they aren’t very sour. They do start out sort of tart, but then the flavor turns sweet. I recommend eating at least two of these at a time. Color: Yellow, Flavor: Lemon – Yeah! Now this is what I’m talking about when I want a good lemon-flavored candy. Like the blue raspberry, the lemon flavor is more tart than sour and finishes sweet. But unlike the blue raspberry, I found the balance of tart and sweet here was just right – like a good glass of lemonade. Color: Orange, Flavor: Tangerine – Out of all the Starburst jelly beans I ate – both original and sour – the tangerine was my favorite, hands down. First of all, hats off to Starburst for having an orange-colored candy that doesn’t have an orange flavor. The tangerine is a delightful surprise! And it’s really good – the flavor is a strong, tart-then-sweet, full-bodied tangerine. Again, this flavor inexplicably reminded me of a LifeSaver. Color: Red, Flavor: Cherry – This was the one jelly bean that actually reminded me of a Starburst fruit chew. The cherry flavor is reminiscent of the Starburst cherry fruit chew, but it’s more sugary and, since it’s a jelly bean and not a chew, the texture is very different. 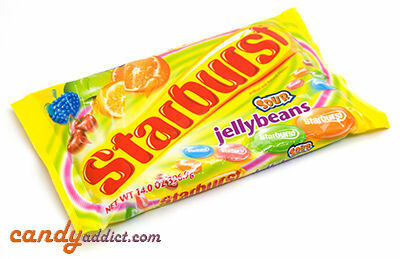 Still, it was nice to eat a jelly bean that reminded me how much I like the regular Starbursts. Color: Green, Flavor: Green Apple – I’m not sure why in the original flavor the green jelly beans are called “apple” but in the sour they’re “green apple.” They both have the apple flavor I expected. However, the sour version is way more tart. It manages to stay tart all the way through the finish, even though the tartness loses some of its intensity. I found I needed to eat at least two to get the full tartness. Color: Pink, Flavor: Watermelon – The watermelon flavor in these jelly beans reminded me of the watermelon Jolly Ranchers jelly beans, particularly if I ate two or more at a time. Eating just one of these for some reason made them taste kind of plastic-y, but eating two made them tasty and fun. Go figure. Overall, I really prefer the sour to the original flavor, but I admittedly like my candy on the tart side. Both flavors were fun to eat and I’d have them again. You take the most wonderful pics (wink). I totally agree with you about mixing them. I actually really enjoyed the tropical variety too.